Difference between revisions of "Citroën Citroneta"
'''Citroën Citroneta/Citroën AZL. 1957–73 (prod. n/a). 2-door pick-up, 4-door sedan. F/F, 375, 425 cm³ (F2 OHV).''' Chilean- and Argentinian-made three-box version of the [[Citroën 2CV|2CV]], appealing to the budget end of the market, especially in Chile. Locally designed body to suit local tastes, and no folding roof. The bodies were partly made in France in the beginning, with the rear end added at Arica; A two-door pick-up with a covered boot at first; in 1963, a more formal four-door sedan with a similar silhouette took over. Larger 0·4 engine from 1964, with an increase of 5 hp to 18 hp. AX-330 took over in 1970 in Chile, partly to respond to the success of the [[Fiat 600]]. '''Citroën Citroneta/Citroën AZL. 1957–73 (prod. n/a). 2-door pick-up, 4-door sedan. F/F, 375, 425 cm³ (F2 OHV).''' Chilean- and Argentinian-made three-box version of the [[Citroën 2CV|2CV]], appealing to the budget end of the market, especially in Chile. Locally designed body to suit local tastes, and no folding roof. The bodies were partly made in France in the beginning, with the rear end added at Arica. A two-door pick-up with a covered boot at first; in 1963, a more formal four-door sedan with a similar silhouette took over. Larger 0·4 engine from 1964, with an increase of 5 hp to 18 hp. AX-330 took over in 1970 in Chile, partly to respond to the success of the [[Fiat 600]]. Citroën Citroneta/Citroën AZL. 1957–73 (prod. n/a). 2-door pick-up, 4-door sedan. F/F, 375, 425 cm³ (F2 OHV). 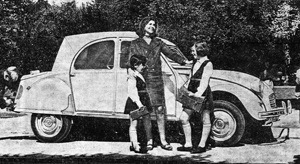 Chilean- and Argentinian-made three-box version of the 2CV, appealing to the budget end of the market, especially in Chile. Locally designed body to suit local tastes, and no folding roof. The bodies were partly made in France in the beginning, with the rear end added at Arica. A two-door pick-up with a covered boot at first; in 1963, a more formal four-door sedan with a similar silhouette took over. Larger 0·4 engine from 1964, with an increase of 5 hp to 18 hp. AX-330 took over in 1970 in Chile, partly to respond to the success of the Fiat 600.